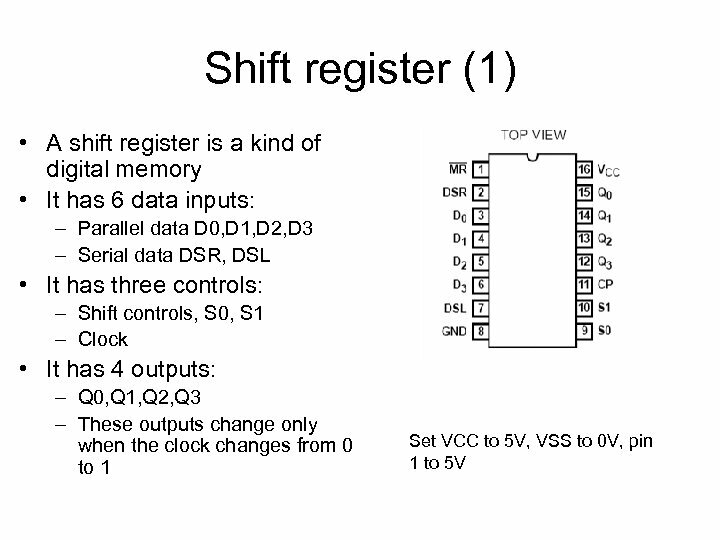 Shift register (2) • The shift register has 4 modes, set by S 0, S 1, and triggered by the clock • When S 0=1, S 1 =1, – Q 0 = D 0, Q 1 = D 1, etc • When S 0 = 0, S 1 = 0 – Q 0, Q 1, Q 2, Q 3 hold their value • When S 0 = 0, S 1 = 1 – Data shifts left: Q 1 = Q 0 (from before clock) Q 2= Q 1, etc – Q 0 = DSR • Test: – attach Q 0 -Q 3 to 4 LEDs in series with 1 kΩ resistors to ground – Set function generator to make a 5 V square wave (2. 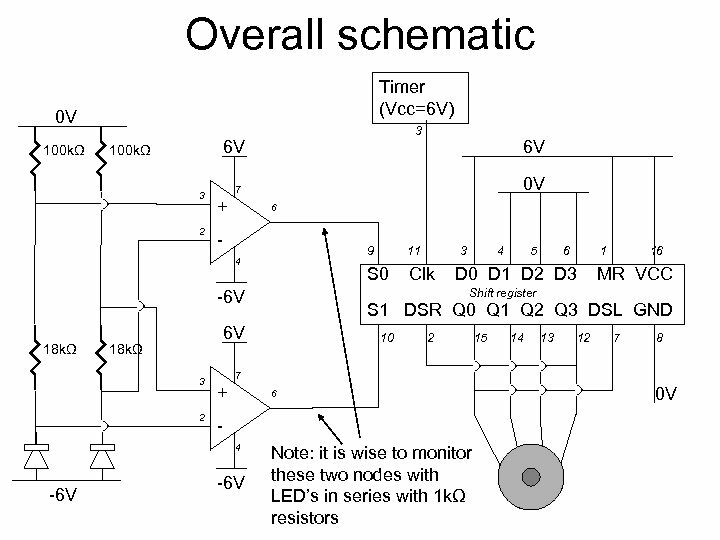 5 V offset) with frequency = 1 Hz, attach it to the clock input – Short D 0, D 2, D 3, and SDR to ground, short D 1 and SDL to 5 V • Try different combinations of S 0, S 1. – Data shifts right: Q 2 = Q 3 (from • What happens? 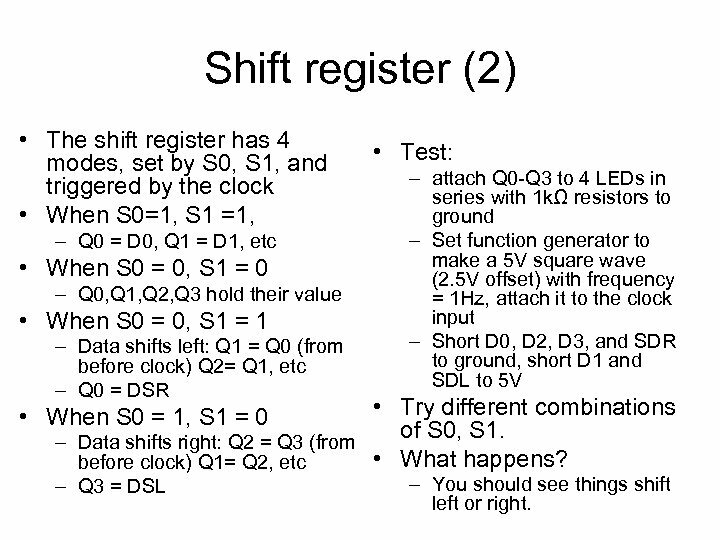 before clock) Q 1= Q 2, etc • When S 0 = 1, S 1 = 0 – Q 3 = DSL – You should see things shift left or right. 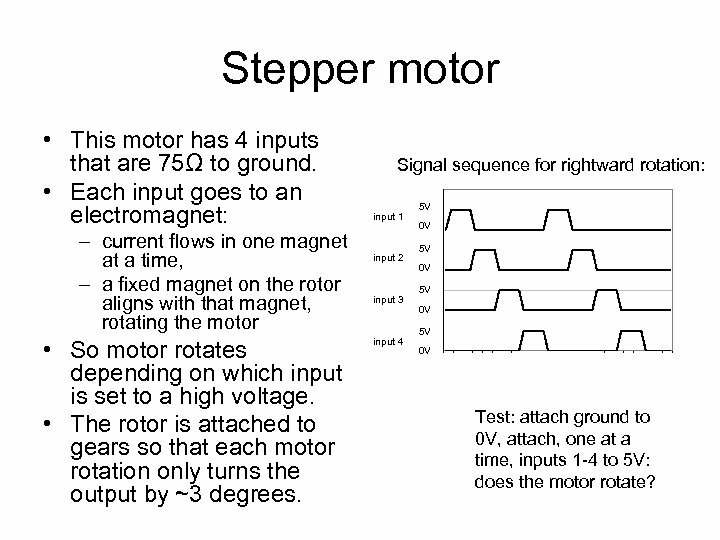 Stepper motor • This motor has 4 inputs that are 75Ω to ground. • Each input goes to an electromagnet: – current flows in one magnet at a time, – a fixed magnet on the rotor aligns with that magnet, rotating the motor • So motor rotates depending on which input is set to a high voltage. 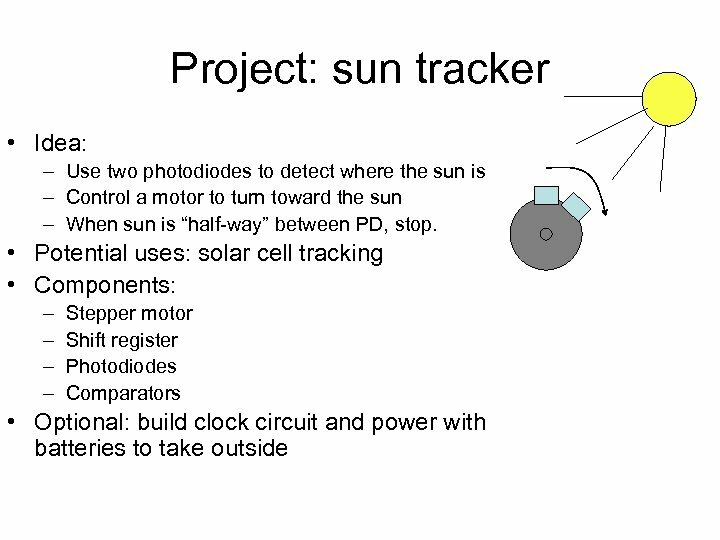 • The rotor is attached to gears so that each motor rotation only turns the output by ~3 degrees. Signal sequence for rightward rotation: input 1 input 2 input 3 input 4 5 V 0 V Test: attach ground to 0 V, attach, one at a time, inputs 1 -4 to 5 V: does the motor rotate? 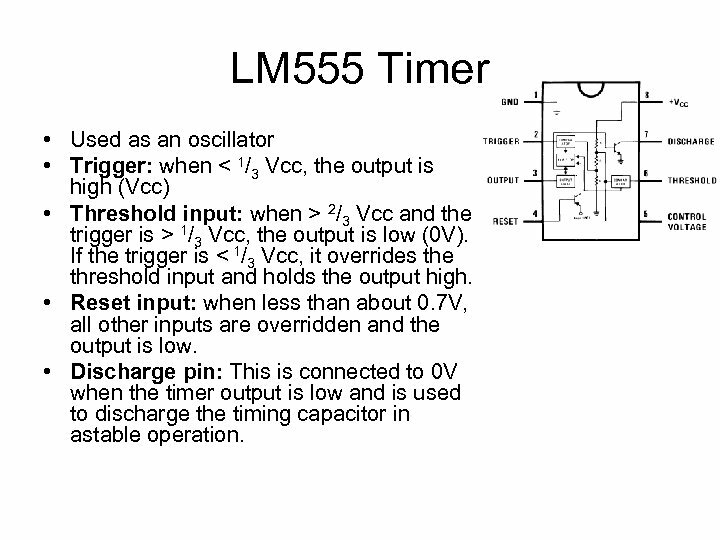 LM 555 Timer • Used as an oscillator • Trigger: when < 1/3 Vcc, the output is high (Vcc) • Threshold input: when > 2/3 Vcc and the trigger is > 1/3 Vcc, the output is low (0 V). 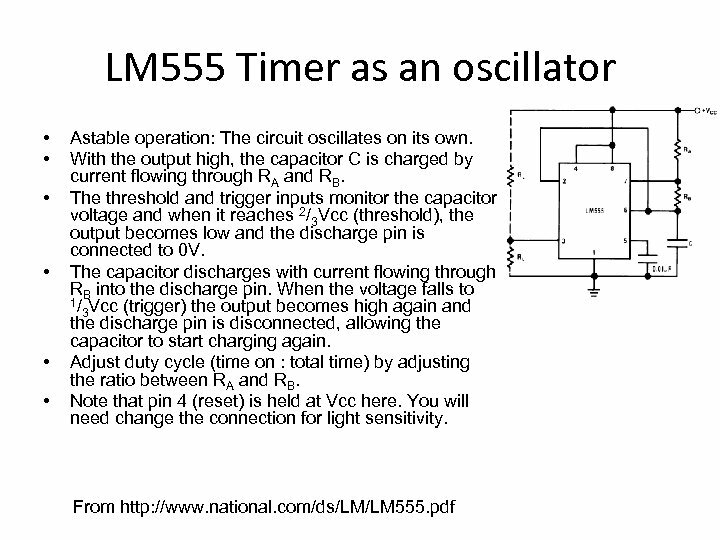 If the trigger is < 1/3 Vcc, it overrides the threshold input and holds the output high. 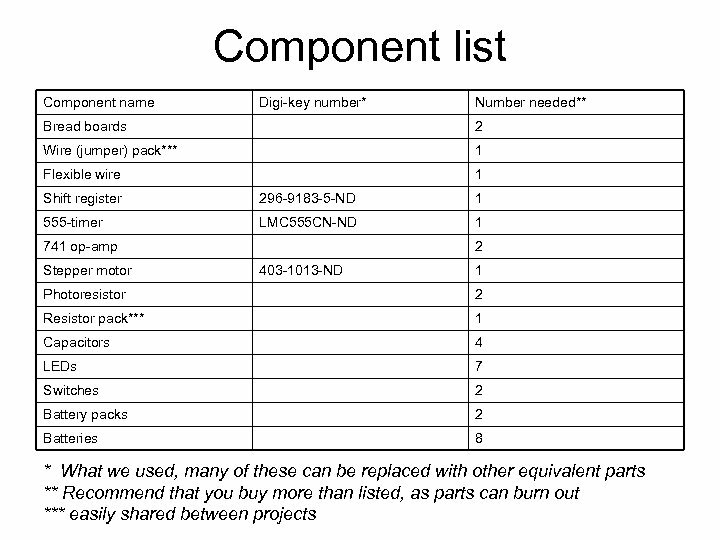 • Reset input: when less than about 0. 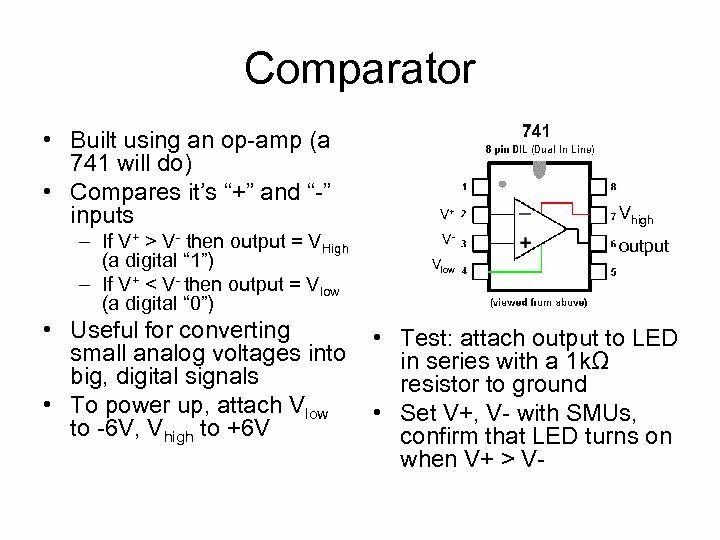 7 V, all other inputs are overridden and the output is low. 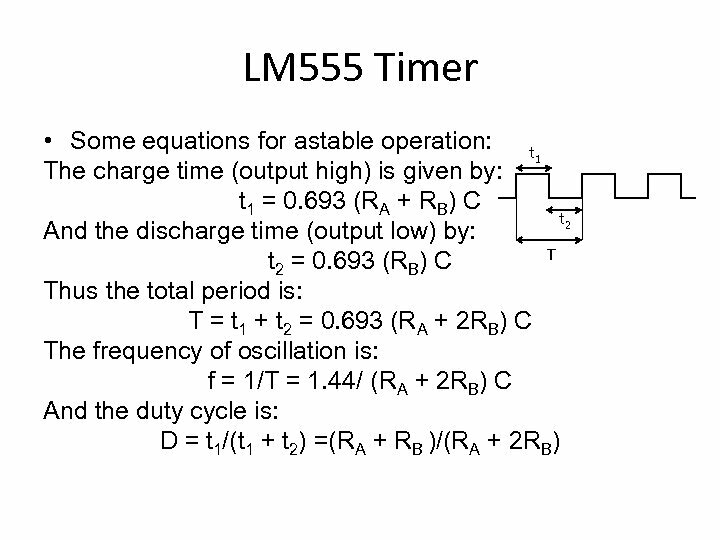 • Discharge pin: This is connected to 0 V when the timer output is low and is used to discharge the timing capacitor in astable operation.